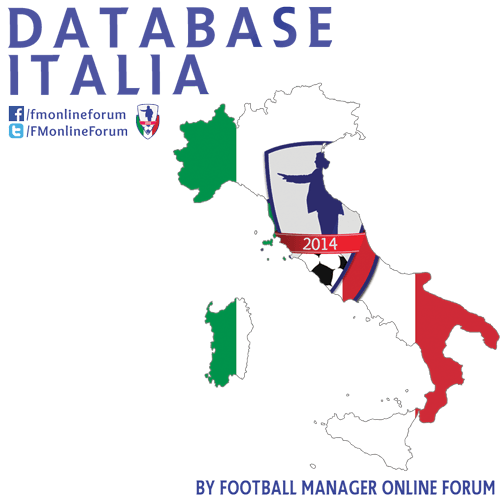 Play within the 5th level of the Italian football pyramid with this database for Football Manager 2016! Created by FMonline Forum. FMonline Forum Italy presents Serie D + Eccellenza for Football Manager 2016. Play in the Serie D or the Eccellenza, the 4th and 5th divisions of Italian football and try the great climb to the top level! The future of Parma depends on you! All, thanks to FMonline Forum, a hot-blooded Italian community for FM! If you want to share the pack, link this download page and our forum; do not host the files elsewhere. Create folder "editor data" if it doesn't exist already. Run Football Manager 2016 and start new save with this database enabled. It's highly recommended to disable "Do not Add Key Staff" and enable "Add Players to Playable Teams" in advanced options. It's also recommended to load all players from Italy using the Advanced... Database Size options. 7 comments have been posted so far. Will this be updated for 16.3? @yipster1986: We had a technical issue with our download server, but it's now sorted. Please try again. Have you done something wrong with Parma ? . When I win Serie D, I get £12 mill as transfer kit and £120k a week as wage buget. Kinda too much for a club with big money issue ?